Yay! The sun’s out! I hope you have something good planned for the weekend? 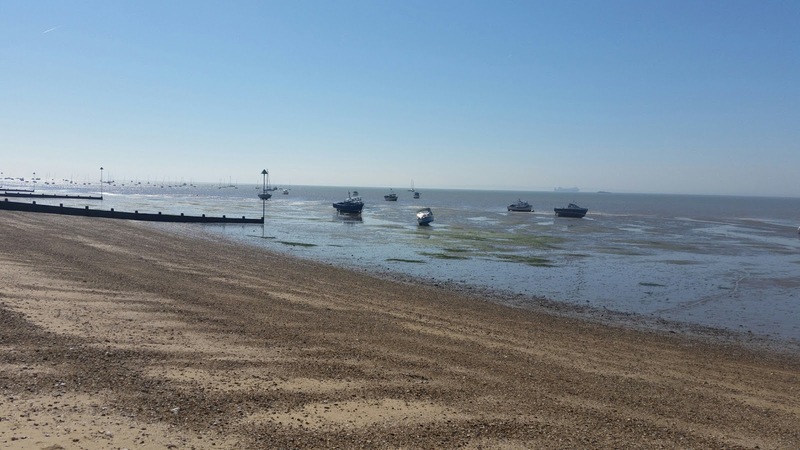 I’m in Essex this weekend and this morning I went out to the beach to take photos for next week’s post. I couldn’t believe I had nearly all the beach to myself! It’s been super busy this past week and I have a lot of catching up to do, but I will be sharing some exciting stuff. This is just a short post from me today. There are lot’s of sales on this weekend, so I want you to know what great deals there are out there. I have also changed my “Ten Under Twenty” to my post on Friday’s and not starting it on Mondays anymore. Things are selling fast and when I featured it here last Friday a lot of items were sold out. I will leave you with my OOTD though! Enjoy and find a bargain! Loving this neutral look, Laurie. Those wide leg pants are so perfect for summer and look great on you. Thanks for linking up! I love the striped top and your woven bag! The beach looks gorgeous! We finally seem to be having the weather to wear our summer clothes yayy! Such a comfy and stylish outfit! What an amazing casual look! Comfy, yet classy! Love it! Nice comfy weekend or vacation look. Thanks for joining the Top of the World Style linkup party. So chic! This outfit would be perfect for me to wear here in Florida, looks cool and comfy yet stylish, love it! Love the neutrals! You wear them so well! Looking beautiful, as always! Great outfit. Thanks for sharing your wonderful posts at Over The Moon Party. Love the beach, it was the first time this year we've been on Saturday. Great look Laurie 🙂 Thanks for linking up. Classy as ever Laurie! The sun is a welcome blessing for us all, isn't it? We're having mixed weather here currently as the warmth is creating sea fog which is a real pain. To answer your question, I'm 5ft 5ins – maybe about the same height as you? The beach looks so nice, can't wait to se the post. Also love this outfit on you. You look comfy yet pulled together! i love your pants and such a great casual beachy look! Totally LOVING that striped blouse, Laurie. It's gorgeous! And YAY for the sun, at last. I really hope it lasts for you!! Really like that casual style on you, Laurie! Essex is looking gorgeous, as are you m'dear! You are smart even when casual, great look and I love that basket/bag with the scarf, so pretty. Can't wait to see your beach shoot! I love your summery outfit! That shirt is so casual, sporty and yet elegant. Enjoy your Sunday! In the sommertime I like cool simple casual and comfortable. You look grea Laurie. I wish you a nice weekend. You look so chic Laurie and I am really enjoying your ten under twenty posts. I love this easy beach look! So sophisticated! Fab super casual beachy look. It's been glorious today but rain Sunday I hear. Yes to Richmond btw.